Cloud chasing, or the practice of blowing out huge billowing clouds of vapor, was once relegated to RDAs; mainly because they had much larger build decks that can accommodate larger, crazier coil builds. However, things are starting to change with the release of numerous high-powered sub-ohm tanks, which is a trend that started when Smok released their TFV4 tanks. The TFV4 was revolutionary in the sense that it was one of the first successful attempts at squeezing in multiple coils into a prebuilt coil head. The TFV4 did okay in the market and became quite popular with vapers, but it did have some drawbacks, not the least of which is its tendency to leak. Smok took the feedback of TFV4 users and made a follow-up that is a whole lot better, the TFV8 Cloud Beast. 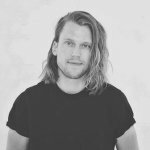 The TFV8 addressed the leaking issue that the TFV4 had, and it also scaled up the number of coils installed in their “hyper engine” coil heads. The Cloud Beast compatible coil heads have up to 8 coils inside them, and they can be vaped at high wattages without burning the cotton or producing uncomfortably hot vapors. The Cloud Beast became so popular that even seasoned cloud chasers found that it is more than enough to satisfy their needs. It was great of Smok to include an RBA base section for the Cloud Beast; this makes it so that if you don’t want to use their premade coils (which can be quite expensive), you can build your own coils instead. Do keep in mind though that the RBA section is pretty basic as this is not the main focus of the tank, but with that said, it is not that bad either. The TFV8 tank itself is quite simple in its construction. When disassembled, the TFV8 is composed of the included drip tip, the top cap with swivel-hinged top fill system and the top shaft section, the glass tank, the premade coil head, and the base section with the airflow control. The one big gripe that I have about the Cloud Beast is that I cannot replace the coil head or access the RBA deck without having the entire tank fall apart. The gold-plated 510 pin at the bottom of the Cloud Beast protrudes quite a bit, just enough to make it safe to use on a hybrid top cap, but in my opinion, you should only use this tank on regulated mods. The top fill design on the Cloud Beast is also a welcome addition. Now, you don’t have to screw off the top cap if you want to refill the tank with juice, just push down slightly on the top cap and push it to the side; a hinge holds it in place. Upon opening the top cap, you will find one kidney-shaped juice port, which in my opinion is a bit too small. Another thing about having just one small juice hole is that there isn’t much room for the air inside the tank to escape from, which often leads to the juice spilling over the hole. When you examine the base section, you will find two gaping airflow holes, which you will need to keep the massive coil heads cool. The airflow holes on the TFV8 are almost 20% larger than those of the TFV4; more airflow means more clouds. The AFC ring though does not have hard stops on both ends, which means it will spin freely, but thanks to a beefy O-ring, the AFC ring does manage to stay in place. The included RBA base is quite basic, but it is much larger than the RBA sections that came with other sub-ohm tanks; you can actually use different shaped coils on the TFV8 instead of just regular round wires. Therefore, this means you can install huge coils and blow respectable clouds. The TFV8 Cloud Beast came with two prebuilt Hyper Engine coils, the V8-Q4, and the V8-T8, which are quite a bit larger than the other sub-ohm coils that other tanks use; they are almost twice as large. The names of the coils may seem quite confusing, and quite hard to remember, but I promise, things will get a bit clearer after I describe them. 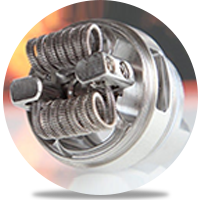 The V8-Q4 is a premade coil that has four parallel coils, which is where the “4” came from. The Q4 kind of looks like a regular sub-ohm prebuilt coil, albeit being twice as large. Besides being made of four separate coils, the inner diameter of the Q4 is quite large that allows for huge amounts of airflow. On the other hand, the V8-T8 contains an unprecedented eight coils, configured into four separate dual parallel coils. Four separate coils mean even more airflow, which also means incredible cloud production. Because the T8 and the Q4 have multiple coils inside them, it means they have a lot of surface area, and because their combined resistances are so low you can pump insane wattages through them; these combined lead to the production of voluminous clouds that were only once possible when using “competition” RDAs. The downside to the TFV8 coils being such high-powered cloud factories is that they are massive juice guzzlers; you will go through bottles of e-liquid at an unprecedented rate if you use the TFV8 as your daily driver. Another drawback to using high-powered coils, in general, is that they will drain your batteries much faster than regular sub-ohm coils. If you are using the TFV8 Cloud Beast, I suggest that you use mods that use at least three 18650 batteries or any large mod for that matter. If you use the Cloud Beast on dual 18650 devices like the Wismec Predator or the Smok Alien, expect that your batteries will run out of juice after a tankful or two of juice. There is no denying that the Smok TFV8 Cloud Beast does live up to its name; it is definitely a cloud chaser’s fantasy come to life. People who want to experience just how it feels to blow billowing huge clouds of vapor, but do not actually know how to build their own coils or cannot be bothered to use a dripper. Smok did a lot of things well with the TFV8. When I first used the tank with the preinstalled V8-T8 coils, I cranked my mod to around 120 watts, which was far beyond what it is usually set at, which is just around 70 watts max. I was quite surprised with some vapors that the sub-ohm coil pumped out. Although the TFV8 coils could produce massive clouds, the flavors that you get out of them are average at best. Even if you turn down the airflow to about 2/3 of the closed, the flavor of the vapor won’t be as satisfying as when you use a small chambered RDA. However, the TFV8 Cloud Beast is not meant for flavor chasing, it is made for chucking huge clouds, and it does it quite well. My personal favorite among the two cores is the V8-Q4 because I like the slightly restricted lung draw it has compared to the really loose draw that the V8-T8 has. All in all, the TF-V8 Cloud Beast works as advertised; it can handle a lot of power, and it undoubtedly chucks huge clouds. Can You Handle the Beast? And Should You? As mentioned multiple times before, the TF-V8 caters to a particular kind of vaper, the one who likes to blow out obnoxiously large clouds. If you’re expecting that huge cloud equals huge flavors, then you will be sorely disappointed. However, the flavor that the TF-V8 is nothing to scoff at, it still produces average flavor, so it is still quite a good buy. If you want to give cloud chasing a try, you should definitely get the Smok TF-V8 Cloud Beast. Do keep in mind that you should not get too hypnotized with the large billowing clouds because you will go through bottles of juice at an alarming rate. If you are thinking of getting your own beast, here’s a link to where you can get the best deals for the kit. The SMOK TFV12 Cloud Beast King sub ohm tank lives up to its title as a massively powerful, 12-coiled vapor monster. Read our review here. 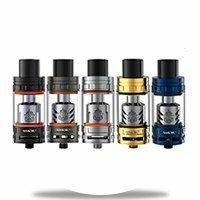 Are you looking for a easy to use sub-ohm tank? Then, the Uwell Crown sub-ohm tank might just be it. Is it worth your money? Read this guide to find out.